SYDNEY – Asian shares slipped for a seventh straight session on Thursday as mixed economic data did nothing to assuage concerns about global growth, keeping sovereign bonds well supported as a hedge against deflation risks. The latest survey from China showed the service sector expanded at a slower pace in April, though firms did resume adding staff. The Caixin/Markit services purchasing managers’ index (PMI) dropped to 51.8, from 52.2 in March, but at least stayed in growth territory. Hong Kong’s version of the PMI slid deeper into contractionary territory to touch an eight month low. The patchy outcomes left Shanghai stocks down 0.2 percent while trade across the region was stifled by a holiday in Japan. MSCI’s broadest index of Asia-Pacific shares outside Japan eased 0.3 percent, and has now shed 5 percent in just two weeks. “I think what has taken place more than anything else over the past 48 hours is the questioning of the reflation trade that was starting to be latched on by many, especially when you consider the recent price action in the USD, commodities and equities,” CitiFX analysts said in a note. One shift already under way was a revival in demand for sovereign bonds, a favoured hedge against deflation. Yields on 10-year US Treasury notes were at their lowest in two weeks at 1.777 percent, a notable rally from last week’s top of 1.94 percent. The equivalent yield in Australia has plunged no less than 31 basis points in the past week as record-low core inflation forced the country’s central bank to cut its cash rate to an all-time low. The rush to bonds has left equities out in the cold. 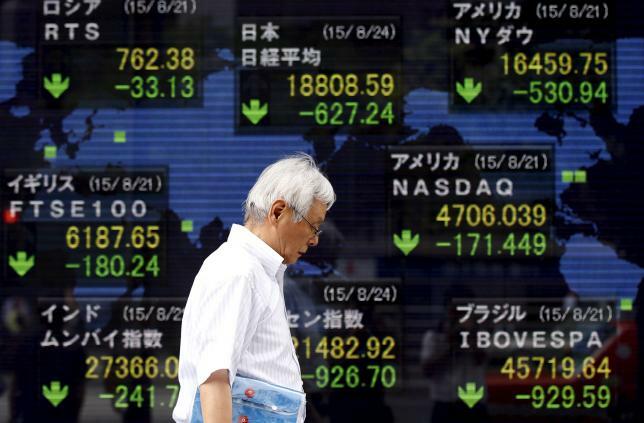 The Dow ended Wednesday down 0.56 percent, while the S&P 500 eased 0.59 percent and the Nasdaq 0.79 percent. Wall Street slipped even as data showed the vast US services sector expanded in April as new orders and employment accelerated, offering hope economic growth would rebound after a sluggish first quarter. Yet other figures showed private employers hired the fewest workers in three years, sparking concerns the all-important payrolls report might also disappoint. Friday’s jobs figures are forecast to show a solid gain of 202,000 in April with unemployment steady at 5 percent. A weak outcome could push back the timing of the Federal Reserve’s next hike in rates and put fresh pressure on the dollar. The US currency has steadied in the last couple of days having taken a beating against the yen and euro. The dollar was holding at 107.11 yen on Thursday, above the recent 18-month trough of 105.55 but a long way from last week’s peak of 111.88. The euro changed hands at $1.1487, having been as high as $1.1614 this week from a low of $1.1213 in April. Against a basket of currencies the dollar was all but flat at 93.247.